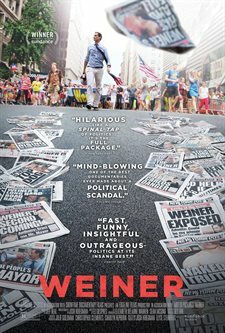 Former U.S. Representative Anthony Weiner's catastrophic race for Mayor of New York City in 2013 is detailed in this behind-the-scenes documentary. Weiner became embroiled in his second widely publicized sexting scandal during the race, derailing his once-promising political career. Weiner is directed by Josh Kriegman and Elyse Steinberg and received its world premiere at the 2016 Sundance Film Festival. 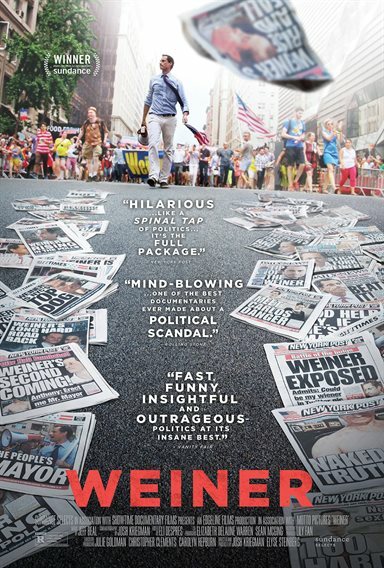 Download Weiner in Digital HD from the iTunes store. Weiner images are © IFC Films. All Rights Reserved. Anthony Weiner has passion. It was evident when he was a member of the House of Representatives from New York. It was evident when he ran for Mayor of New York City in 2013 and it was evident when he was caught in a sexting scandal... not once, but twice. Weiner is vocal and stubborn and, at times, volatile. It's a wonder why he would let a film crew follow him around, but, in 2013, that is exactly what he did. Documentary filmmakers Josh Kriegman and Elyse Steinberg were given an enormous amount of freedom while on Weiner's Mayoral campaign trail and they have hours of footage that was condensed down to 96 minutes. What they captured is a raw view of a slice of real life as a career and a marriage careen out of control. The "fly on the wall" technique used by the directors is both effective and disturbing. We, as the audience, see an overview of the running of a political campaign and how the cogs begin to break down as the latest scandal rocks the foundation of the group. We also see an unprecedented look inside a marriage that is clearly suffering and possibly even imploding. Weiner is not a likable guy and the camera is not kind to him. Even early, archived footage of his days in Congress show a man so intent on getting his point across he all but throws a temper tantrum on the House of Representatives' floor. One could commend Weiner for his enthusiasm and his desire to help his constituents and he brings a valid argument to the table; however, as he yells at other grown adults in order to make that point, he simply seems like a spoiled brat and not much of a politician. Of course, there is also the scandal that basically derails his political career and ruins any chance he will ever have of running for office again. The filmmakers are keen to capture as much of the behind the scenes drama as possible and Weiner gives them a wide berth of what they can film making the documentary authentic and not a piece of propaganda. They even get his latest partner, Sydney Leathers, on camera as she desperately attempts to try and speak with the former Congressman. Honestly, I'm not sure which one of the two come off as more pathetic. Unfortunately, the real tragedy is the view we see of Huma Abedin, Weiner's wife and the mother of his son, Jordan. While an intelligent and successful woman, Huma seems to become a shell of herself as time goes on, and the scandal takes more of a toll. We see her withdraw, not only from Weiner's Mayoral campaign, but, from their personal life, as well, with the final straw being a potential showdown with Leathers outside a party as Weiner loses the Mayoral race on election night. Kriegman and Steinberg effectively manage to take us on an emotional ride that makes the audience simultaneously loathe Weiner and Leathers while pitying Abedin. The access they were granted allows them to film some intense exchanges with Weiner and his staff and some heartbreaking moments between Weiner and Abedin. What they get and edit together makes for a smart, gripping film that is alternately enjoyable and hard to view. I can't imagine Weiner understood what would be the end result when he agreed to let them film but, luckily for us, he did allow them to do it. The end result is worth the hour and a half final product. Weiner images © IFC Films. All Rights Reserved.